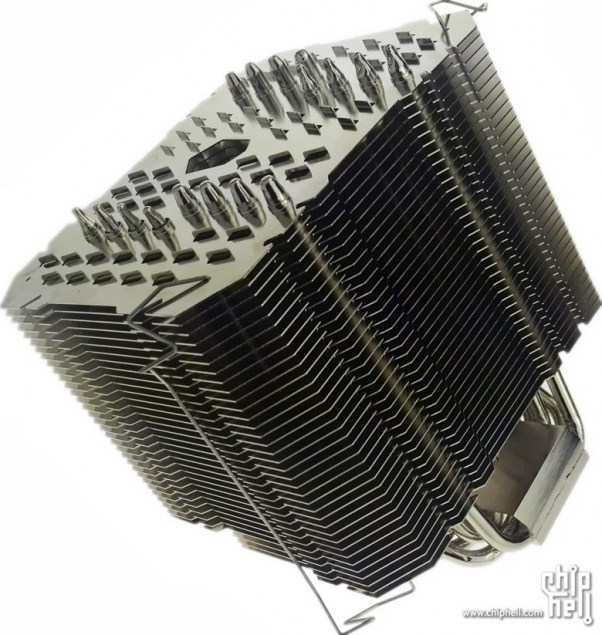 New pictures of the upcoming HR-22 CPU cooler have hit the web. Thermalright’s new flagship heatsink is meant to be the successor of their already big HR-02 and is said to bring improvements in the cooling and compatibility departments, notably for use with tall memory modules. While the official specifications haven’t been released yet, the leaked pictures point to the behemoth featuring eight 6mm heatpipes bent in a U-shape configuration and metal clips to hold a single 140mm fan. As is the tradition at Thermalright, the HR-22 is expected to contact the CPU with a nickel plated copper base and dissipate the heat by means of an aluminum fin stack. The sheer size of this unit will surely make it suitable for fanless operation on lower TDP processors; at the same time it seems ready for mounting a second set of clips for adding another 140mm fan for maximum dissipation on higher TDP CPUs. The company did not mention any availability dates nor did it name a price. Considering the flagship status of this cooler, it is expected to be in the top of the price range, flirting with top notch AIO liquid coolers. What remains to be seen is if it can also compete in terms of performance. That is an epic heatsink. That thing makes my Ultra 120 Extreme look tiny by comparison. Even makes my Silver Arrow SB-E Extreme look small. I would venture to guess it needs a fan with a fairly high rpm to get enough airflow through the heatsink. I wonder if it will fit a 120mm or 140mm fan. That thing is huge. Will it get in the way of my PSU? Wow! This looks twice the size of the TRUE 120! If my Swiftech H220 craps out again I might just have to go with this. It probably cools the cpu just as well. I stil have my TRUE 120 in my HTPC cooling my Q6600. I switched to Noctua though in my recent build due to Thermalright products not being available in Canada anymore. Just a few online retailers with old stock they haven't gotten rid of yet, no one seems to have new Thermalright products here. I wonder if it will fit a 120mm or 140mm fan. It says it will fit a 140mm fan, but you can see little holes on the other side to mount another wire clip for attaching a second fan. It looks like it will fit 2 x 140mm fans in total. I don't think it's big enough. Needs MOAR! Hahahahahaha....that's awesome. Insanely impractical and likely a massive fail (how do you get pressure against the CPU? ), but awesome nonetheless. I wonder how much that behemoth weighs? Better be careful moving your case w/that monster installed. It has to be through hole mount right? Because I can't see any socket taking the stress of having that hanging off it. Its little brother the HR-02 is weighting in at 860g, excluding bracket and fan. This one has to be over 900g, maybe even a kilogram. I too would think that if you were to drop your case with this thing installed on the CPU, it may very well rip your board apart. would need a push-pull config this monster has to be it. There are definitely heatsinks out there that weigh more than the HR-22, such as the NH-D14 and Phanteks dual-tower style heatsinks. Also, the HR-22 is designed with low fin density with low air flow situations in mind, so a single fan would work fine on this heatsink. Pardon my ignorance if this is an obvious answer, but would it be practical to have four fans (two push, two pull) so that the air flows diagonally through the fins? Interesting idea. It might be tough shoehorning 4 fans into a computer case though -- especially 38mm fans. I'd like to see the cooling performance of such a setup though. Has anyone tried this before w/any of the various thick, box like heatsinks before? It might even be as good as some watercooling setups just base on the amazing airflow you would be getting. If so, I don't think it would work well as it would create some air turbulence in between, but I could be wrong.